44.8% Vitamin A, 213.6% Vitamin C, 4.8% Calcium, 5.4% Iron. 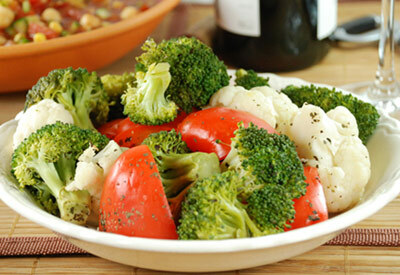 Place broccoli, cauliflower and bell pepper in the center of a sheet of heavy duty foil. Sprinkle with basil, pepper and salt. Top with ice cubes. Bring up sides of foil; double fold top and ends to tightly seal packet, but allowing room for heat circulation inside the packet. Grill 15 to 18 minutes on medium-high on covered grill. To cook a vegetable packet in your oven, preheat oven to 450 degrees F. Assemble packet as directed, place on a baking sheet and bake for 20 to 25 minutes.